A Gigaom article confused connected car vehicles with an opportunity to create information superhighway news. he article titled “GM makes a U-Turn on connected car highway, leaning heavily on Apple for apps,” is not only incorrect, it slanted towards iPhone-aholics. Unfortunately, that article will be remembered more than the clarifications that GM has stated now to analyst Strategy Analytics connected car analyst Roger Lancot. Here are the GM clarifications. GM is not getting rid of MyLink. 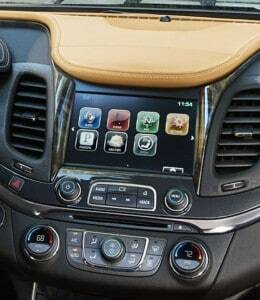 MyLink is the name of Chevrolet’s infotainment system (Cadillac’s is CUE and Buick/GMC is IntelliLink). So, all the connected radio and infotainment features GM offers within Chevrolet vehicles are part of the MyLink platform. When the day comes that GM does implement Apple Car Play or Android Auto, those would be offerings within the MyLink platform too. Articles and/or headlines that state we are abandoning or disinvesting in MyLink are not accurate. Note: Chevy MyLink has builtin voice commands and Pandora streaming radio. While GM is committed to working with Apple and Google to implement their respective phone projection systems, this won’t be customers’ only option for information and entertainment services within the vehicle. We see CarPlay and Android Auto is another option for customers to get the services they want within vehicles, but we will also continue to offer a variety of built-in infotainment features as well. GM is implementing a strategy of both built-in and brought-in connectivity in order to give customers their preferred method of accessing information. General Motors remains committed to bringing the AppShop (CUE Collection in Cadillacs) to market in the future as part of an overarching connectivity strategy. The decision to delay this feature beyond the 2015 model year was based on the company’s commitment to ensure all infotainment systems deliver the highest quality and best user experience to our customers. Development work is ongoing. However, at this time we have no specific timing to announce. We Know GM is working on smartwatch apps because we recently saw and recorded a demonstration. Meanwhile what happened? We see it this way. A reporter who only understands wireless products such as iPhones and Android is stuck in Las Vegas with nothing to write about at Super Mobility Week. There were no new products to announce and even the major carriers didn’t show up. Industry analyst Sascha Segan wrote there could be no best in show because there was no show. The reporter talks briefly to Mary Chan in a very loud convention hall, hearing only what he wants to hear. He doesn’t know the connected car lingo of GM. He doesn’t know about the GM announcement that it had postponed the App Shop only for now. He doesn’t watch the daily mechanizations of connected cars like AUTO Connected Car. Besides that it was hot as hell in Las Vegas. By Friday, September 12 it was 100 ° F. Not to mention the distractions of Vegas itself, flashing lights, show girls and other salacious Vegasness. Then he comes up with a fun headline that everyone will want to read. Of course iPhone fans want a CarPlay only world. But this is America and the name implies it is “General Motors” a company that will continue to give the American public many options. Fitchard did update his post on Friday, September 12, we assume after GM corrections. It still reads like GM leaning on Apple for apps. « 4G LTE coming to 15 car makers, which ones, when?